Computer repairs Perth, WA - Microsoft certified service "
Some people tend to search for computer repairs Perth, whether they live in Perth or in the suburbs. 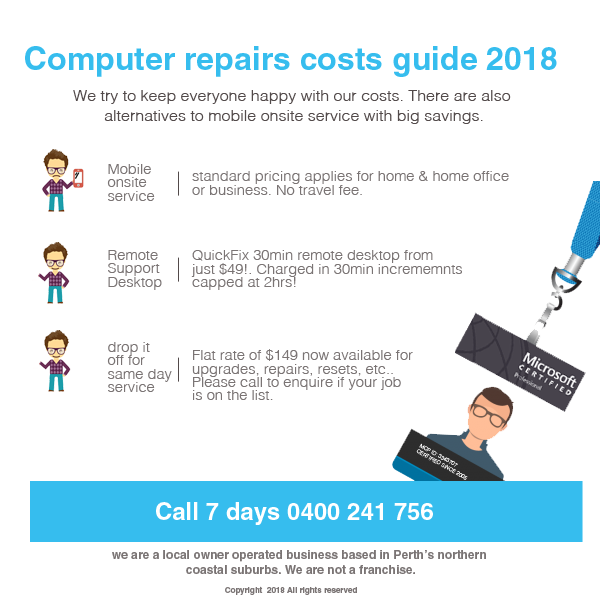 As a mobile computer service we generally respond to local calls from Perth and along the northern coastal and northern suburbs in proximity. Almost every call received from a hotel room from visitors to Perth in the last year was resolved by logging in remotely. 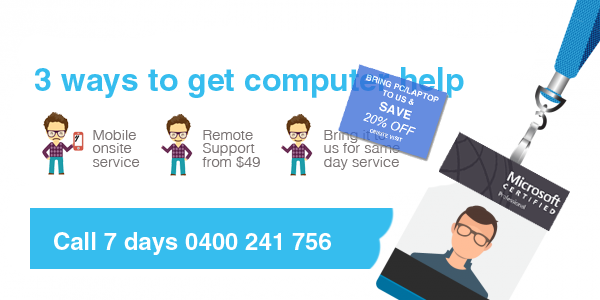 Whereever you are in Perth or greater Western Australia, including remote areas, we can help with our various services for connecting to your computer. You'd be surprised the number of issues we can fix online in a timely manner. 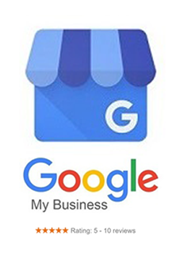 Regardless of which service connect you choose, from straight to your door, online access, or bringing your PC/laptop to us, you can usually expect same day service or at worst, overnight service. We understand no one wants to be without their laptop or desktop right arm for too long! Our remote computer support service utilizes industry standard encryption to offer the highest levels of protection. You can see every thing we do and all the mouse movements and pages we open. It's all 100% transparent. Because we are Microsoft certified (system and network analysis and support) you can expect the same level of professional expertise and technical knowledge as dealing with Microsoft support directly. You can be assured we have up to the minute training in Windows 10 and its sub systems. You don't pay a premium for Microsoft certified technicians. Charges are based on accepted industry standard support pricing. We are also the first with flat rate pricing for most general in-workshop jobs. Please enquire. Our charges start at just $49! We are Just a short drive from Perth to Duncraig - or from any of the northern suburbs if you want to take advantage of our fixed flat rate packages and still get same day service. migrate Internet Explorer or Microsoft Edge favourites and settings (home page and choice of search). Our customers generally appreciate this level of service. It saves them days of doing it all themselves. But there is a new pricing model for people who do not need full service. Tip of the day for our Perth readers. Did you know that backup does not equal safe backup? This is a common misunderstanding or assumption. For example, let's say you have an external drive (our preference is the WD Ultra with no 240v power cord), configure your backup and forget about it. When disaster strikes you try to implement the backup only to discover its broken or corrupted. In Windows 10 the new backup system is called File History. This is a real time backup replicating all your files on the fly. You can direct to the backup to look at or recover files. The problem with any backup tool is that if a malicious program or virus infects the system this will affect the backup. Even backups to mybox and Onedrive can damage your backed up files. The "image backup in windows 7" which is available in windows 10 is now deprecated. So, we are seeing a number of damaged image backups which cannot be recovered by normal means. There are best practices depending on your system and they can generally be deployed free of cost. Please enquire. We can show how to make big savings off the cost of a new SSD hardware purchase. We source the best prices on the day and direct you to that source, through our various distribution channels. It's local or in Osborne Park. The money you save on the cost of a new SSD can be significant which you can put toward our labour costs. Book in today and avoid the inevitable low stocks as holidays approach.